Among Quebec historians, there is often spirited debate concerning the ancestral patriarch of La Belle province. Some argue that Jacques Cartier, who first came to present day Quebec in 1534 and staked claim of the territory in the name of King Francis I of France, is deserving of the honour. Others believe Samuel de Champlain, who founded Québec City in 1608, the city that became the capital of French Canada and all of New France, is the most obvious choice. To this day the discussion continues. One thing that our Francophone friends do agree on is the quality of their 250 golf courses scattered throughout the province, from Montreal north to Tremblant and from Québec City east to Charlevoix. Ask any golfer about their sport in Canada’s beautiful province and their first response will likely refer to the year-round vacation playground of Tremblant, Quebec’s most popular golf destination. 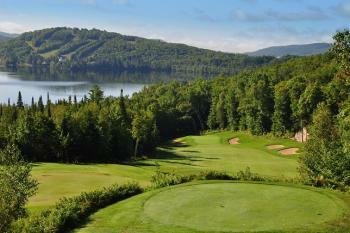 With a variety of excellent golf courses to choose from, Tremblant is a short, 90-minute drive north of Montreal. Regardless of your leisure bias, Quebec’s “Trembling Mountain” is a year-round outdoor getaway. Great skiing set the stage for the evolution of great golf and now this mountain retreat boasts six outstanding courses. 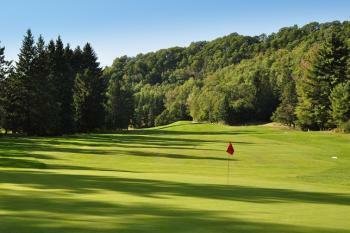 Getting to Tremblant is as easy as a tap-in putt. Porter Airlines offers direct flights from Toronto’s Billy Bishop island airport, or you can fly Air Canada from Pearson to Montreal’s Pierre Elliott Trudeau (PET) International Airport. 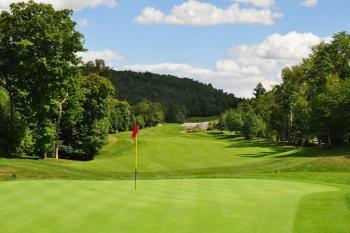 Other than playing Royal Laurentian first, there isn’t any particular order you should play Tremblant’s courses. Royal Laurentian appropriately describes itself as “the gateway to Tremblant,” as this is the first golf course you’ll see from Highway 117 heading into Tremblant. Located 10 kilometres south of the village, Royal Laurentian is owned by the Menard family and sprawls 6,814 yards over gently rolling terrain. The course was built in 1989 and is renowned for its floral displays and Italian sausage at the halfway house. Take it from a guy who normally has no more than a banana at the turn – be sure to try the famous Royal Laurentian sausage en route to the 10th tee! 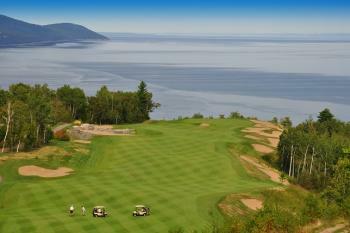 Gray Rocks is the name of the golf operator of Tremblant’s La Belle and La Bete golf courses – the Beauty and the Beast. I’d recommend easing into this segment of your golf itinerary by playing La Belle first. Measuring 6,330 yards, it’s the friendlier of the two courses but equally enjoyable. It is also the oldest golf course in the area. In fact, it was the first 18-hole layout in Tremblant, built approximately 85 years ago along the meandering Devil’s River. Among La Belle’s many redeeming qualities, it’s the only course you’ll play in Tremblant that you can comfortably walk - something I appreciate more the older I get. La Bete, as the name suggests, can be beastly at times. It’s a player’s golf course and one of Graham Cooke’s best designs. Carved through the Laurentians’ pine forests along the Devil’s River, the course measures a daunting 6,840 yards. Fortunately there are three other tee decks to choose from for those of us who don’t want to experience what it’s like to compete in a long drive competition on every tee. The two golf courses that put Tremblant on the map are owned and operated by Intrawest. Le Geant (The Giant) was designed by Thomas McBroom and weaves its way 6,836 yards up and down precipitous hills and cliffs. With hole names like “La Vallee” and “La Descente,” you don’t have to speak French to get the point. Le Geant’s final two holes may be the best finishing holes in Tremblant. The 457-yard, 18th is called “Concentration,” probably because it’s the longest par 4 (from the black tees) on the golf course. With a stunning view overlooking Lac Tremblant, I’d rename this hole “Distraction” if I was the boss. The other Intrawest course is Le Diable. It is devilishly good and then some. Designed by the dynamic duo of Michael Hurdzan and Dana Fry, Le Diable was my favourite golf course in Tremblant – hands down. Featuring Hurdzan/Fry’s trademark red-sand bunkers, the course flows naturally through stands of pine trees and ascends its way to the top of rocky pedestals overlooking forests and lakes for as far as the eye can see. Nowhere is this more apparent than from the tee deck of “Gray Rocks,” the 535-yard, par-5, 15th hole. As you step onto the tee deck, don’t be in any rush to hit your drive. Take a deep breath and savour the moment. 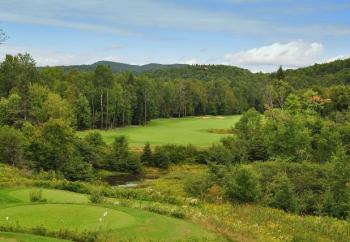 You have now experienced the epitome of Tremblant golf. Thank you, Michael Hurdzan. A close second to Le Diable is Clublink Corporation’s Le Maitre. Inspired by Fred Couples and designed by Graham Cooke and Darrell Huxam, “The Master” is a solid, 7,025-yard design that features wide fairways and generous greens. It is a walkable course for a fitness fanatic. If you’re a guest at one of the hotels in the village, access to Le Maitre is doable; otherwise getting a tee time can be a challenge. In between golf I’d recommend checking out some of the other outdoor activities Tremblant offers. 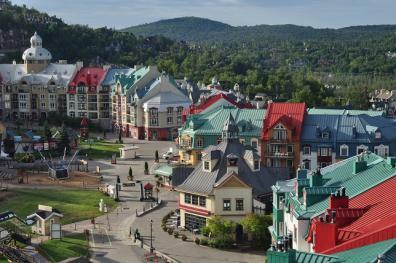 If you stay at one of the hotels in the village, there are plenty of activities to choose from, including the gondola lift to the top of Mont-Tremblant, the highest peak (968 metres) in the oldest mountain range in the world (The Laurentians), as well as mountain biking, hiking, and water sports on Lac Tremblant. In addition, there are a variety of outstanding restaurants within walking distance from all of the hotels in the village. To fully appreciate Tremblant and its great golf courses, I’d recommend a four-to-five day visit. To play all six courses in the area means one or two days of 36 holes, but for most golf aficionados I know, nothing could be better. Anytime is a good time to visit during the golf season. As you might expect, Tremblant’s golf season is somewhat shorter – late May to early October. The weather in July and August is predictably good, but for fall colour seekers there is nothing more spectacular than seeing Tremblant ablaze in mid/late September. 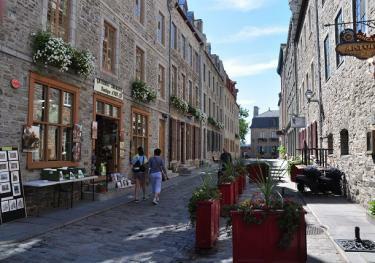 If time permits, I recommend extending your stay and visiting Québec City and the beautiful region of Charlevoix. A day in Québec City is a day you will certainly remember. Nestled below the city’s iconic Chateau Frontenac Hotel along the banks of the St. Lawrence River, the historic part of this charming city is a walk back in time – some 400 years back. Stone buildings dating back to the 1600’s form what is referred to today as “Old Town.” After walking the narrow cobblestone streets and indulging in the local fare, you’ll appreciate why Québec City has been recognized as a UNESCO World Heritage treasure. For golfers, I suggest the 7,203-yard Club de Golf La Tempete, located across the river in the south section of the city. Host of the 2009 Skins Game, La Tempete is another Cooke/Huxam collaboration and is widely considered to be the best golf course in the city. About an hour east is another Quebec destination that is more popular for its skiing than its golf. Mont-Sainte-Anne has attracted skiers from Ontario and Quebec for years and is comparable to Tremblant for its quality of downhill runs and alpine adventure. The golf isn’t quite the same but Golf Le Grand Vallon is a 6,618-yard design that provides a decent test for any golfer in need of their next 18-hole fix. Guests of the Chateau Mont Sainte-Anne can take advantage of the many stay-and-play packages available from June through August. It is 90 minutes east of Mont-Sainte-Anne, along the shore of the St. Lawrence River, that you will experience the best of what Quebec has to offer - Charlevoix and the venerable Fairmont Le Manoir Richelieu. Along the way you’ll experience the Charlevoix Flavour Trail, introducing you to the area’s best culinary producers and their fruits, vegetables, meats, cheeses, ciders, beers, and chocolates. As you drive along Route 362, otherwise known as the River Route, you will travel through the quaint towns of Baie Saint-Paul and Saint-Irenee, where you’ll find yourself in the middle of an art lover’s paradise. There are more art studios, painters and potters in these tiny towns than anywhere else in Quebec. It was here in Baie Saint-Paul, in 1984, that two young street performers named Guy Laliberte and Gilles Sainte-Croix started a little-known traveling circus act that is now known around the world as Cirque du Soleil. If you have ever driven along Cape Breton’s Cabot Trail, the drive from Baie Saint-Paul to La Malbaie is equally breathtaking. The centrepiece of La Malbaie is the Fairmont Le Manoir Richelieu, another incredible Fairmont property, which was opened in 1925 by former U.S. President William Howard Taft. Just as the Banff Springs has been coined the “Castle in the Rockies”, the Fairmont Le Manoir Richelieu is eastern Canada’s “Chateau near the Sea”. For golfers, there is the Club de Golf Manoir Richelieu, a 27-hole configuration featuring three distinct nine-hole designs. Originally crafted by English golf architect Herbert Strong, the course was recently renovated by Darrell Huxham and can easily be played in less than four hours. Believe it or not, all of what I have described was experienced in a week. Such is the life of a golf and travel writer. For those on vacation, I recommend a much slower pace and taking at least 10 days to enjoy Tremblant, Québec City, Charlevoix and everything in between. In 1883, architect Eugene-Etienne Tache had the motto “Je me souviens” (“I remember”) carved in stone below Quebec’s coat of arms above the Parliament Building’s main entrance door. It is believed that his intention was to remind people of the past, present, and future individuals who have, and will, shape Quebec’s history. Over the years, Tache’s phrase has been used by many other Quebec figures for a variety of reasons. While the expression may have different connotations, a more modern-day interpretation of “I remember” is aptly applied when describing Quebec’s golf scene and the other cultural delights that make a visit to Canada’s “La Belle Province” a must for golfers and non-golfers alike.